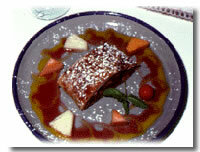 If you like Mediterranean and Latin food you'll like Peacocks restaurant in Cabo San Lucas. You have a choice of where you would like a table. Either on the patio or in the main building. 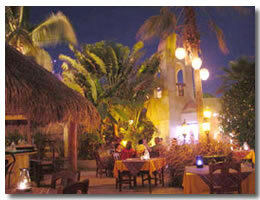 We went for the patio as it was a nice evening as it is on most evenings in Cabo San Lucas. We got our menus, and looked to see what they had to offer us for our appetizers. As per usual, for me the appetizer with garlic was my one and only choice. It was Tritico Di Mare. This was shrimps, scallops and calamari sauteed in garlic and herbs. I love garlic, and this will generally win over anything on the menu for me. Our other choice was lobster dumplings. This was something we hadn't seen on any menus so far so they had to be ordered. Both of the appetizers tasted good, and went well with our Caesar salad that was prepared at our table. By this time we were aware that we had a team of waiters bringing our food and drinks out. This seemed to make everything run a bit smoother. For our main course we again went for fish dishes. The fish has always been fresh in every Cabo San Lucas restaurant we've been in. It doesn't have to travel that far from that marina, ands that's probably the reason why. Our first choice was the El Pascado Del Patron. It said on the menu this was Peacocks restaurant's owners favorite so we took that as a good recommendation. It was grilled fresh catch of the day with Mexican white rice, topped with a relish of green tomatoes with fried leak. Our second order was Blackened salmon. This was blackened in a chili powder mix, and served with a spicy mango sauce. Out of the two orders the El Pascado Del Patron was the better one. But it was the owners favorite so it had to be good. For our desert we had puff pastry peacocks that were stuffed with ice cream. Ice cream is another one of my favorites so this choice was always going to be nice. Paseo del Pescador, next to the Hotel Meliá San Lucas entrance. Cabo San Lucas, Baja California Sur, Mexico Phone/Fax: (624) 143-1858.